I have been walking...not "training" walking, exactly, but I'm getting the miles in. The Spouse Thingy had a few days off, so I've been getting the time in a little creatively; on the 25th we checked out a mall near Sacramento that we'd never been to, and we spent a good two hours walking around there. 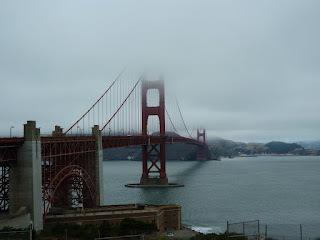 On the 26th, we went to San Francisco so that I could see the Golden Gate Bridge up close, and we walked across that, and then spent some time walking around Union Square and then Pier 39. Yesterday we walked around a flea market, and today we walked around Six Flags. Since we don't tend to ride a lot of the rides, we walk around looking at stuff, and logged in at least 6 miles there today. Tomorrow we're probably going back to San Francisco, and all we're planning on doing is walking the Wharf, seeing what's there that we haven't seen before. Lots of walking going on, just not "walking." But it totally counts, right? Oh yes ... It counts! The countdown truly begins. The hills are alive, with the sound of OMG WTF?